Newer properties have newer fixtures and fittings, so the starting value of those items is higher, resulting in higher depreciation deductions. The same applies to the capital works deduction. 2.5 per cent of the structural costs of a building can be claimed per year for forty years. Construction costs generally increase over time, making building write-off deductions on new buildings higher. 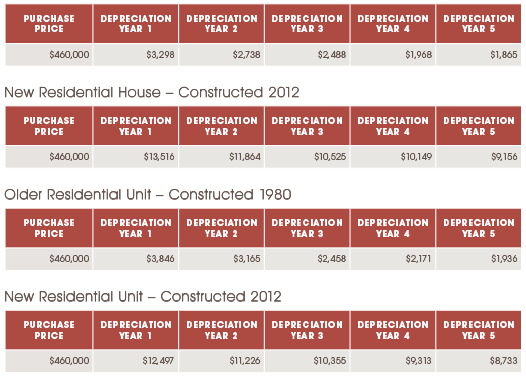 Owners of older properties can claim the residual value of the building up to forty years from construction. For example, if an investment property is five years old, the owner will have thirty five years left of capital works deductions to claim. Capital works deductions are governed by the date that construction began. If a residential building commenced construction before the 15th of September 1987, there is no building write-off available. Investors who own properties that are built before this date will still be able to make a claim on the fixtures and fittings within the property* and include any recent renovations, even if the renovation was carried out by a previous owner. It is always worth getting advice about the depreciation potential of a property regardless of age. The deductions are not as high on older properties but there are usually enough deductions to make the process worthwhile. investment properties, all purchased before 7:30pm on the 9th of May 2017*.